One of Bengal's best-known -- and most homey and delicious -- vegetarian dishes is alu posto, or potato with poppy seeds. 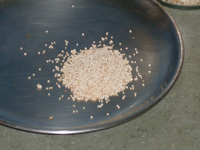 Poppy seeds used in Bengal are mostly tiny, brownish white, and grain-like. It may sound strange -- and scary -- that posto is derived from the same plant as opium poppy. But, fear not, dear reader. Poppy seeds used for cooking are harvested from dried pods versus the green pods, which used to extract opium. Today's post is merely the tip of the iceberg. So much can be written about the tiny seeds and they pack so much of flavor. A recipe of alu posto is in order, too. So stay tuned. Until then, here is the Wikipedia entry. Enjoy. A three-judge panel of the appeals court ruled earlier this month that he can once again take up his work but under the limits decided upon by Judge Cote.